(Phys.org) —New research from Oxford University casts doubt on the theory that the Mount Toba super-eruption, which took place at the Indonesian island of Sumatra 75,000 years ago, could have plunged the Earth into a volcanic winter leading to the near extinction of early humans. A fresh analysis of volcanic ash recovered from lake sediment cores in Lake Malawi in East Africa shows that the eruption spewed ash much further than studies have previously found. Other theories have said that the explosive volcanic eruption may have triggered a chain of climatic events resulting in a cooling of temperatures, but this latest study finds no evidence of a significant dip in temperatures in East Africa at the time. The findings are published in the early edition of the journal Proceedings of the National Academy of Sciences. The researchers from Oxford University and the University of Minnesota in Duluth, USA, examined microscopic volcanic ash recovered from sediment extracted from two sites in Lake Malawi in the East African Rift Valley, around 7,000 kilometres west of the source of the Toba eruption. Their analysis showed that the thin layer of ash deposits revealed in the sediment cores was from the last of the Toba eruptions – known as Youngest Toba Tuff (YTT). The lake sediment has accumulated over thousands of years and records an undisturbed history of the environment and climate in East Africa. The researchers searched through 20 metres of sediment located at between 20 to 40 metres below the lake floor. The cores were drilled from two points (at a northern and a central position of the lake basin). The researchers sieved the sediment and used a heavy liquid floatation technique to find glass shards concentrated within a fine layer at 28.1 metres below the floor of Lake Malawi, in the central core, and 26.8 metres in the northern core. Tiny glass shards are created when magma ejected from a volcano freezes in flight. The shards were identified under a microscope as they are too fine to be distinguished by the naked eye. 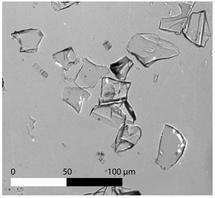 The researchers also used an electron microprobe to confirm that the chemical composition of the glass shards carried the chemical 'fingerprint' of the Toba super-eruption or, in this case, the YTT. Significantly, this part of Africa is where early humans are thought to have originated and other studies have suggested that the super-eruption could have been the cause of a human genetic population bottleneck – whereby the numbers of early humans were significantly reduced. Had there been a significant cooling of temperatures in the region, it is likely that living matter near to the lake surface would have been killed off and the sediment composition of the lake would have undergone a dramatic change. However, when the researchers analysed the algae and other organic matter found in the core's layers where glass shards were discovered, there was no evidence of a significant temperature drop in East Africa. Lead author Dr Christine Lane, Leverhulme Early Career Fellow at Oxford University's School of Archaeology, said: 'By tracing a microscopic layer of volcanic ash from the 75,000-year-old Toba super-eruption within sediments from Lake Malawi, we have been able to show that the largest volcanic eruption of the last two million years did not significantly alter the climate of East Africa. Our results therefore contest the theory some scholars have put forward suggesting that early modern human populations in East Africa were dramatically reduced to near extinction due to the climatic effects of this eruption. Our research implies this was not the case as there is no evidence of a "volcanic winter" in this region. The YTT eruption provides a precise age for the sediments within which it lies, so the analysis of the Lake Malawi cores provides a benchmark by which other key climatic events in this region can be chronologically pinpointed. The study suggests that other regional and global dating records about this region, which have been correlated to Lake Malawi's climate record, may need to be revised in the light of these findings. There is a boatload of serious archaeology claiming a human bottleneck here in Kenya about the time or shortly after the Toba events. Why are these folks quiet now? And how about the fundamentalist dinosaur denyers and bible thumpers..where are they now?